Box of Sixty (60) 8" Long Natural Miswaks. These Miswaks are all freshly harvested and shipped by air from Pakistan fresh every month. Note: We do not accept returns on miswaks. 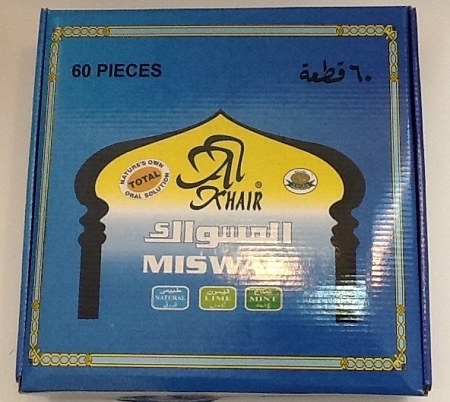 If you are not familiar with these miswaks then purchase single packs before purchasing a box. The miswak (miswaak, siwak, sewak, ??????) is a teeth cleaning twig made from a twig of the Salvadora persica tree (known as arak in Arabic). It has a long, well-documented history and is reputed for its medicinal benefits. It also features prominently in Islamic hygienical jurisprudence. "Were it not that I might over-burden the Believers I would have ordered them to use Siwak (Miswak) at the time of every Prayer." "Four things are from among the practices of the Prophets: Circumcision, Perfume, Miswak, and Marriage. "Make a regular practice of Miswak for verily it is the purification for the mouth and a means of the pleasure of the Lord. A 2003 scientific study comparing the use of miswak with ordinary toothbrushes concluded that the results clearly were in favor of the users who had been using the miswak, provided they had been given proper instruction in how to brush using it. 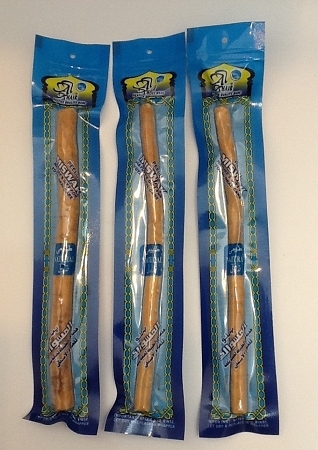 The World Health Organization (WHO) recommended the use of the miswak in 1986 and in 2000 an international consensus report on oral hygiene concluded that further research was needed to document the effect of the miswak. Dr. Rami Mohammed Diabi,who spent more than 17 years researching the effects of miswak on health, and especially its anti-addiction effects on smokers (curative and preventive sides), has opened a field of science and research with his last publication: "Miswak Medicine Theory" or Sewak Puncture medicine which led him to what is called Beyond Sewak: World of Science and Research. Studies indicate that Salvadora persica extract is somewhat comparable to other oral disinfectants and anti-plaque agents like Triclosan and Chlorhexidine Gluconate if used at a very high concentration. 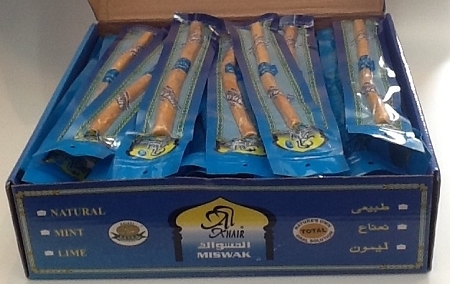 The use of the miswak is frequently advocated in the hadith (the traditions relating to the life of Muhammad). Situations where the miswak is recommended to be used include, before religious practice, before entering one's house, before and after going on a journey, on Fridays, before sleeping and after waking up, when experiencing hunger or thirst and before entering any good gathering. In addition to strengthening the gums, preventing tooth decay and eliminating toothaches, the miswak is also said to halt further increase in decay that has already set in. Furthermore, it is said to create a fragrance in the mouth, eliminate bad breath, improve the sense of taste and cause the teeth to glow and shine. In addition, benefits not related to the teeth and gums include sharpening memory, curing headaches, creating a glow on the face of the one who continually uses it, strengthening the eyesight, assisting in digestion and clearing the voice. Narrated Abu Hurairah: The Prophet said, "If somebody eats or drinks forgetfully then he should complete his fast, for what he has eaten or drunk, has been given to him by God." Narrated 'Amir bin Rabi'a, "I saw the Prophet cleaning his teeth with Siwak while he was fasting so many times as I can't count." And narrated Abu Huraira, "The Prophet said, 'But for my fear that it would be hard for my followers, I would have ordered them to clean their teeth with Siwak on every performance of ablution." The same is narrated by Jabir and Zaid bin Khalid from the Prophet who did not differentiate between a fasting and a nonfasting person in this respect (using Siwak). Aisha said, "The Prophet said, "It (i.e. Siwak) is a purification for the mouth and it is a way of seeking the acceptance of God." Ata' and Qatada said, "There is no harm in swallowing the resultant saliva." Narrated Abu Burda: My father said, "I came to the Prophet and saw him carrying a Siwak in his hand and cleansing his teeth. 'Abd al-Rahman son of Abu Sa`id al-Khudri reported on the authority of his father that the Messenger of God said: Bathing on Friday for every adult, using of Miswak and applying some perfume or cologne, that is available-these are essential. A miswak should be one hand span in length when selected. If it becomes dry, it should be soaked in rose water to soften the end bristles. The end should be cut afresh to ensure hygiene and should never be stored near a toilet or sink. Everything was great about the Miswack, the only thing was, it wasn't spicy! In Yemen, that's how you can tell from a good one or a not so good one!